Technology is all about making our lives easier. Boarding your flight after noticing a few potential crying babies or chatty neighbor; you’ll need all the aid you can get. We have compiled a list of cool gear and tech hacks that can keep you from losing it 30,000 ft in the air. Our goal is to keep you being productive as ever. Thank goodness for smartphones; but curse their short lifespans. A Mophie slips onto a phone as easy as a regular case fitting like one as well. They can hold anywhere from 80-120% of your iPhone battery depending on the case. As a bonus it also allows you to charge your phone without even removing the case with a micro USB charger. Carry on bags take on a lot of shapes from Nike duffel bags to beach totes; but how many of those allow you to get through TSA checks faster? None. TimBuk2 bags open up flat for security checking. Whilst still providing fantastic laptop support and enough space to secure your belongings. Sure paper books are great, but who has space in their bag? And wouldn’t it be better used by snacks or an extra power bank. Kindles have an impressive battery life and a ton of space for the reading you’ve been putting off. This pen memorizes not only everything it writes but also uploads them on your app. Which makes them accessible at any point. As opposed to the notebook now serving no use in a conference room halfway around the world. Smart suitcases are the best new thing that used to be stuck in the old age. Bluesmart offers a builtin scale, USB chargers, a digital lock, and location trackers! Depending on the duration you board with a brave face and hope that nothing runs out of batter before you land. Did we mention they raised 2M on indigogo? The Flash Drive incorporates a rechargeable battery enabling users to authenticate access before plugging into a USB port. 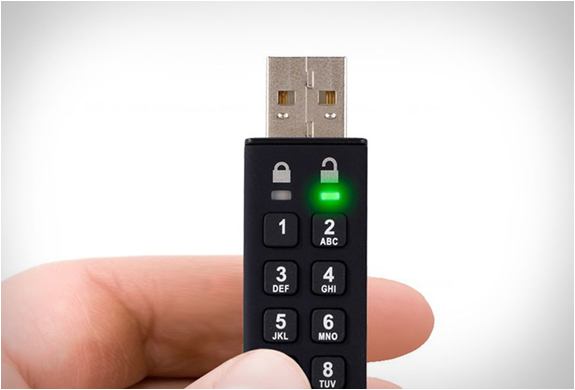 Users simply enter their secure PIN and plug the drive into any USB 2.0 port on a compatible device. Once access is authenticated, the drive “unlocks” the media. Slim enough to never consider leaving it behind but important enough to never forget to pack it. The credit card sized charges 1% of your microUSB compatible device in a minute! Charger sports 10,000 mAh, enough to charge your smartphone multiple times. This is a blessing on a 12 hour flight with no layover. The Knomo Knomad packs your work essentials in a sleek and easy to use lay out. If you fly with a small tablet for work or entertainment such as the iPad mini a knomad will help to organize and prepare. Also juicing your tech if you’re not using it. By producing counter waves against background noise you can sit in some long over due peace and quiet. They ensure the best sound cancelling on the market. Finally you can keep participating in mental Karaoke without being interrupted by criers, snorers or chit chatters. Did we mention they’re gorgeous and just as great to use in the office? With so much new tech out there tell us below in the comments which one you think needs to be added onto the list. If you liked this article be sure to check out our tips for long flights.